Beautiful! So great to be reminded of all that God has given us and all that we can do with the talents we were given! Darlene- it is always good to get those reminders. These are great reminders when u are going through love them all…. I totally agree about the reminders, because in today’s world we need it. Your friend in Nashville is sharing this message of Lenten self-examination for the purpose of holy change. Blessings to you and your ministry. Thanks Jules for passing this message on! ¡Saludos! from México. Thank you. This list is what I needed. Thank you. I needed this! I am going to print it and put it by my bed do that I am reminded of what is really important first thing in the morning and lastly before bed. Good stuff, always try to be a blessing to those I meet, to forgive those who don’t understand and to have wisdom in all I do. Careful, Phil — looks like this may be getting some major wings, at least based on the number of ‘Shares’ I’ve been seeing. Can’t wait to read it myself, and I’m thinking of sharing one a day with the folks in the congregation I serve. You’ve connected Lent to the real everyday walk of faith that people are seeking for changed lives as followers. Bless you, brother! Ron – we are all a work in progress. With God’s strength all things are possible. True – Maybe two a year! I love this! I would like to link to this post in my blog. I don’t get # 40. Isn’t it a sin not to love life? Would it be too overwhelming to select one number to put all of your focus on each day for 40 days? Essentially giving up something new each day with your entire heart? Or is it more beneficial to chose one to focus on for 40 days? I know there is no right or wrong, but would one be potentially more effective in the purpose of lent? We call the series the 40 things to give up for Lent and beyond. This is not just for the season of Lent. It is good to focus on one of these for a season. Thanks Adam! Hard to believe you were the first one to point that out. There is much on this list for me to give up. Replaced with what? I’m in such a dark place. How to begin the renewing of my mind? One moment at a time (Look at that sunset), one hour at a time (Take a walk and enjoy the scenery), One day at a time (Make an improvement in your environment/home). Befire you sleep be grateful for something. The good things build on each other and the darkness will fade. You have to forgive yourself and others to move forward. Life is beautiful and goes quick. Don’t dwell in the darkness. Make small changes and they create bigger changes. I read the book entitled when God winks at you. It’s about all the little reminders every day that God loves us. After reading it, I bought a desk calendar type book and every day I write down those little signs that I see it. It may be that a flock of geese flying over while I was outside in the backyard, or a bluebird that hardly ever comes to our yard appearing suddenly, grandson making me laugh, the sun shining on the frost on the deck showing tiny spectrums of color, or getting a chance to help a friend, having a prayer answered etc. When you’re having a bad day you can go back and read some of your God winks. It gives you a happy feeling and you realize how much He cares. This is where you find your very best friends, Go to a small church where people greet you and make you feel needed. I know how it feels to get out of that dark place. God loves you just as you are. I pray you wil lsoon feel the joy of His love. Prayers for you Lasaundra! This is a list to live our lives by! Thank you for sharing it. I’m printing it out and keeping it right where I can see it every day. God Bless. Our steps to a better and more fruitful life! One at a time. Thanks for sharing!! God bless. Enjoyed the comments, as it was llike having a spirited conversation. Loved #40. Had to read it twice and it Filled Me. Thank you. Fix the language in item 29. Beautiful. We sometimes need guidance to follow such a simple command as “make a sacrifice for lent.” Ambiguity creates its own problems. YES…#29 does not read correctly but I get the idea…. Thanks Meg for the catch! “Seek ye first the kingdom of GOD”…Put God first in your daily life………Give up your Heart to GOD for lenten season and always………Make HIM first in your life…….”Thou shalt have no other GODS before me”….. I take issue with numbers #32 and #39. First of all, not all change is good. In fact, it’s an affront to God, and should not be accepted, embraced or tolerated by His children. This includes, but is not limited to allowing the government to infringe on religious freedom, feminism, and liberalism. Sorrow is not sinful and in fact, God wants us to come to Him with our sorrow. Sacred Scripture says the following on the subject: “Cast all your worries upon him because he cares for you” (I Peter 5:7). Good thoughts Christopher – I do want to point out that the verse you quote tells us to “give up” our worries to God. True feminism (not what some have turned it into) is a very good thing. Sorrow for sin is good; sorrow over things already forgiven is bad. Sorrow that prompts a change in behavior is good; sorrow that controls is bad. thanks for to words but should be everyday not only for lent these are comforting and encouraging words may god continues to use u to spread is words god bless u. This is a great list of things that I know I need to give up on! Most of them!! What a thought to GIVE UP those things that really pull us down over and over in life! Thank you for this! It would be great to translate it into Spanish. Phil, this is truly excellent. I’ll be sharing with our church. thanks for your work on this, may it bless many! Iron sharpens iron! Thanks for these very insightful thoughts to ponder…and, I stated; not just for Lent, but, for the rest of my life. I will certainly keep this list, and, probably add to it as I go. Blessings! #41 – our sin, or at least the lack of sensitivity to it. Thank you so much. I did not grow up in a church with a Lent tradition and I do not know very much about it, but this is a great list and challenge. These are so great. They truly speak to my heart. I am sharing these with our women’s ministry leaders at Ada Bible Church in Grand Rapids, Mi! Thank you. I look forward to these daily emails, keep up the good work! Here’s my response. Thanks for the reminders! Quite insightful. Wow! Exactly what I need. Surrender: I will give up all that I don’t need to have a more faithful life. That is what I have begun to do and will continue throughout Lent and I will keep a log of these things and how I truly feel as I give them up. All of these things are something we should do every day, not just during Lent! Some of these things can be so hard, even when you live with faith. I appreciate the love and time that it took to put this together. I smile looking forward to achieving each one of these with my God. This is such good advice! May I reprint it in our church’s March newsletter? thank you for these! during this time of year the pressure to give up or “sacrifice” something(s) is sometimes overwhelming and can get to be a kind of contest or a “holier-than-thou” display of piety. I really appreciate you helping to put the Lenten season into a helpful perspective. This list is helping me to look at Lent in a way I’ve not before. Its more than just giving up something in order to think about Christ’s sacrifice, its a conscious effort and a much needed plea for God’s grace in dealing with our sinful, selfish selves. in the past Iv’e given up things like certain foods, entertainment methods, music, etc., but I feel now that doing all those things is useless without real action in my spiritual life. Thanks again! Pastor Phil, Day #5 references Monday, but I thought it was supposed to be Sunday. With 40 days in Lent and 40 days in the study, you can’t be skipping Sunday. I am a little legalistic! Is it supposed to be Sunday? I am really having to work on some of these things! Since having 3 kids my impatience level has skyrocketed. Thanks so much! Hi Rachelle- the 40 days of Lent do not include Sundays. Take a look at the calendar and count the days between Easter and Ash Wednesday. You will notice there are more then 40 Days. The idea is that we fast on the days weekdays and Saturday. Then on Sunday we celebrate the resurrection and cease from our fast. Sundays during Lent are designated Sundays in Lent rather than Sundays of Lent for this very reason. I really needed to read this as I am currently walking the valley of losing my spouse and working thru many deep hurts and rejection from folks who have instilled in me that I have no value or purpose in this life. However no matter what I am loved by God. 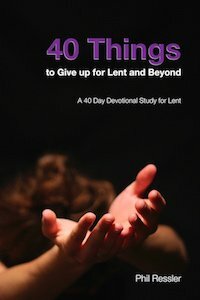 Our Church’s Facebook Page shared the link to the 40 things to give up for Lent. One member mentioned the cite as our Lenten Series group met last night. Thanks for offering a good example of Lenten possibilities and lifetime possibilities to those of us in Odessa, Texas. For #9, the Bible reference you used at the end is Romans 6:23, but the verse that says “for all have sinned and fall short of the glory of God” is Romans 3:23. Giving up people pleasing? Yeah, because those pesky starving poor with their begging are just keeping you from God, right? Fail. Can u make these 40 into a poster that can be framed? Elaine- that is an interesting idea. We will look into that. Pastor Phil, I would love the 40 things in a poster form like Elaine said. I just learned about your poster from my sister Dina and she told me that for me, I needed to work on 9 and 22. She was so right on. I was hoping that you were going to post it again this year. Wonderful to read and be reminded of these things, but even greater it must be to live them. To truly be humble, to truly give your life for GOD’s purpose and not your own selfish desires. I work daily to not only remember, but to live these wonderfully said phrases. I look forward to these for Lent now, they are necessary and worthwhile for me. I appreciate the love that has been put into their creation. Many thanks for things that we can strive for every year of our life. In our move which after living in one place for 40 years I lost my book on the 40 things to give up for Lent so I will not only buy another one but get at leadt one extra to share with our Pastor. Thank you for your new series I am sure I will love as much as the first one. It makes my Lenten experience so personal. God Bless your ministry. Would you allow me to re-publish your list ina Catholic quarterly next |March? Looking forward to doing this devotional again. to a “TO DO LIST”.